Every year, Americans generate some 220 tons of waste that’s a little over four pounds of curbside garbage per person, per day. And much of this waste ends up in landfills, where there’s not enough air, water, sunlight and bacteria to let it decay quickly. In a landfill, garbage decomposes slowly. Bacteria convert available organic materials into gases, including greenhouse gases such as methane and carbon dioxide. U. S. federal regulations require that these gases be captured and sometimes used for energy for at least 30 years after the landfill stops accepting waste. Then monitoring might cease, and gases from a former landfill might escape into the atmosphere. In 1995, the Environmental Protection Agency began an initiative that allowed a handful of bioreactors to come into being. These are landfills in which the bacteria are encouraged to flourish with wastewater sprinkled in the trash. In these experimental projects, garbage decomposes faster and that cuts down on gases lost to the atmosphere. Instead of being produced over many years as the landfills age, the gases are produced up front, when monitoring and capture are vigilant. Greenhouse gas reduction isn’t the only advantage of bioreactors. 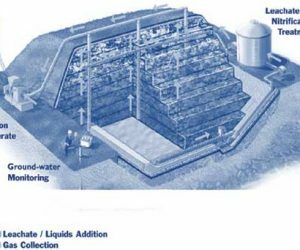 The reactors also address another pesky problem of landfills, leachate production. Leachate is water, rainwater or wastewater, that flows down through the landfill picking up lots of pollutants as it travels downward. By the time it reaches the bottom of the landfill, it’s pretty nasty stuff. Landfill operators are required to capture and collect this water, as it would be very bad if it got into the groundwater near to landfills. To prevent leakage, landfills are required to lay down plastic liners, and hard packed clay and soil beneath the plastic. But even so, over many years, these protections can be breached — especially if toxic substances in the garbage eat their way through the plastic. But bioreactors greatly speed up the leachate process. 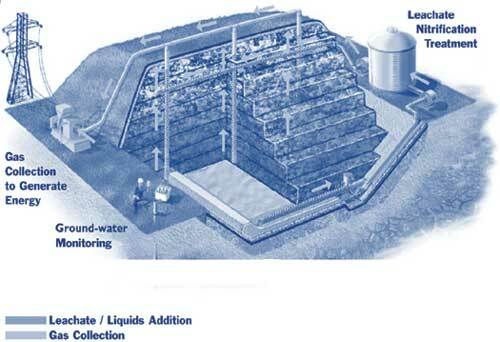 With water constantly being flushed through the garbage, the leachate collected becomes less and less polluted. And early in the process when the water is quite nasty, the leakage protections are new, and better able to cope. One of the biggest experimental bioreactors exists in Yolo County, CA. Here, county and academic researchers placed many sensors inside the landfill, to monitor temperature, moisture, and chemistry over the years.